Our native bees come in all shapes and sizes – from the uvuncular bumble bees to the sporty leafcutters and the tricksy nomads. One of my favourites is also one of the most inconspicuous – you may well have seen them around a garden campanula, mistaken them for small flies and thought no further. Whilst I’m not advocating flies as worthy of oversight, the harebell carpenter bee (Chelostoma campanularum) is certainly rewarding if you take the time to look a little closer. These tiny black bees are just 6-7mm long and black all over. The females have a white scopa – as illustrated in this BWARS profile of the bees – and the males are very similar in size and appearance. We have a number of campanula species which are native to the UK, including the harebell along with a range of bellflower species which are larger and more akin to the ornamental garden varieties, such as nettle-leaved bellflower. Fortunately, these little harebell carpenters don’t seem too fussy and I’ve watched them on two different ornamental cultivars in our garden over the past few years. To watch these bees around the flowers, you might be forgiven for wondering what precisely they’re doing – they often look for all the world as though they love the flowers… but don’t know what to do about it. 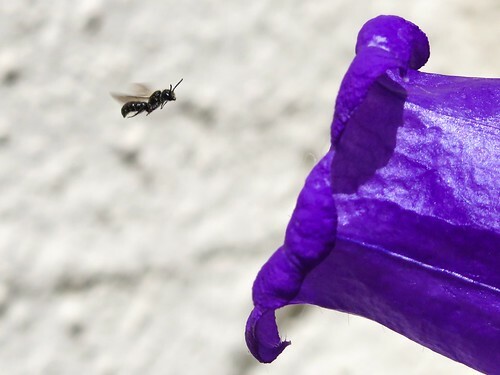 In fact, they are intimately intertwined with the genus – the females will only collect pollen from bellflowers and this blog from Urban Pollinators has some great images of their specialised means of collecting this. They also mate in the flowers and females will wait for males in the flowers, whilst the males will swarm and circle around on the hunt for females! Males will often shelter in the flowers in dull weather too. These bees are aerial nesters – this means that they will seek out opportunities such as dry stems and holes in wood to nest in. This makes providing for this species in your garden very straightforward – simply plant some campanulas (the native harebell is a delightful addition to any garden) and provide some bundles of reed or straw at height for them to nest in. The bee is on the wing from June through to August and has a mostly southerly distribution in the UK but certainly occurs around Grantham in the midlands! 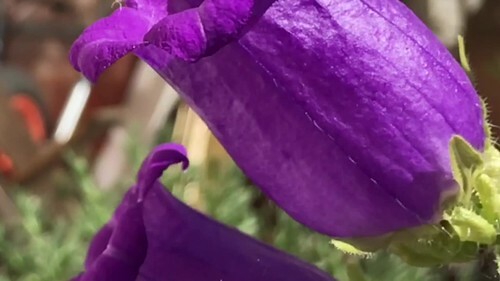 Below is a slow-motion video of the harebell carpenter bees in our garden flying around an ornamental bellflower – but if you want to see some excellent images of the bees at rest, check out Ed Phillips’ blog post here. And if you want the detailed image of males and females, as well as habitat shots, head over to Steven Falk’s flickr albums!